The UK’s Chief Veterinary Officer has urged sheep farmers to remain vigilant for bluetongue virus (BTV) after the disease was picked up and dealt with in a consignment of four sheep imported from France. 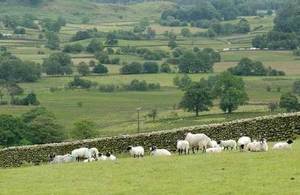 The Animal and Plant Health Agency (APHA) and the Pirbright Institute identified the disease as part of routine post-import testing when the sheep were brought to Lancashire. The four sheep have been humanely culled as a result. Bluetongue does not affect people or food safety. The virus is transmitted by midge bites and affects cattle, goats, sheep and other camelids such as llamas. It can reduce milk yield, cause infertility and in the most severe cases is fatal for infected animals. The midges are most active between May and October and not all susceptible animals show immediate signs of contracting the virus. Action is being taken to ensure the spread of the disease is prevented, with movement restrictions at the affected premises. This follows similar action taken for two affected cattle last month. Discuss their needs with a private veterinary surgeon and consider the risks and the health status of animals when sourcing stock from regions affected by bluetongue virus, such as France. Consider what additional guarantees the seller can provide as to the animal’s vaccination status before purchasing (for example – by requesting that a pre-export test is carried out to prove immunity to BTV). Ensure that imported animals are accompanied by original health certificates and are kept by the person who ordered the consignment. Prevent the disease spreading by practising good biosecurity on their farm premises. Stay alert to any signs of the disease, such as mouth ulcers and drooling from the mouth and nose, and report to APHA immediately. "Bluetongue does not pose a threat to human health or food safety, but the disease can have a serious impact on farming productivity by causing sheep infertility. This is particularly important at this time of year. "This detection is another example of our robust disease surveillance procedures in action but must highlight to farmers the risks that come with bringing animals from disease-affected areas into their herds. It is also a clear reminder for farmers that the disease remains a threat, despite coming towards the end of the season when midges are active. "Farmers must remain vigilant and report any suspicions to APHA. They should also work with importers to make sure effective vaccination needs are complied with and that all animals are sourced responsibly". The UK Government has worked closely with a number of groups to raise awareness of the threat of bluetongue through the Joint campaign Against Bluetongue (JAB). More information about bluetongue is available here.